Lithoglyphus naticoides inhabits large rivers or similar habitats. As it spread to Schleswig-Holstein from the southeast, its localities are restricted to the southeastern part of this federal country. It prefers hard substrates. 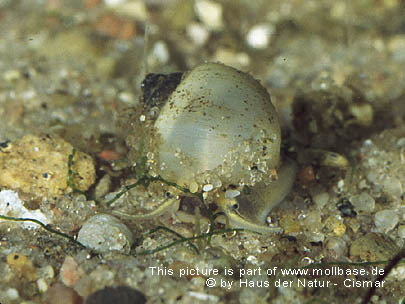 The shell is sometimes heavily incrusted. 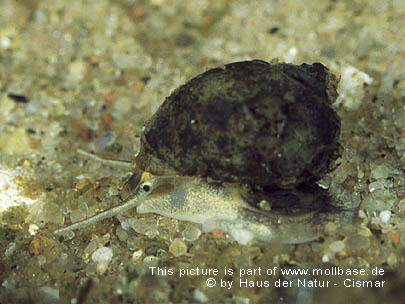 The shell is about 8-10 mm in length. The colours of head and tentacles (yellow and black stripes) are typical for the species. Sorry, this page was added in order to show the photos - sorry - up to now no new map. If you have children, enjoy visiting the noncommercial Kinder-Tierlexikon.